My track record with party cakes has never been the greatest, but hey, I'm always ready to give another one a try. This month for the daring bakers we were challenged to a cake. Easter dinner with family was the perfect occasion. The recipe from Dorie Greenspan's Baking From My Home to Yours. What I loved about this cake is that following Dorie's basic recipe, using her suggestions with the lemon in the cake, the fruit preserves, and the butter cream, there's a lovely flavor balance. It felt like there was a gauzy light fairy bridge of flavor suspended between each element, tied all together with a nice little bow. I particularly loved the effect of applying coconut to the outside, which gave it a festive and feminine look, a touch of grace after my not so great job of spreading the buttercream. I have to admit I was feeling rather sorry for myself until the coconut came in. I had trouble getting the cake to rise so I did bake this cake several times and ended up using three flat layers instead of two layers cut in half. The butter cream was quite easy coming together and tasted great. I have never put fruit preserves in cake before, and it was something I will do again. When you are in a rush to finish this cake with guests coming, having a vacuum cleaner within arm's reach at the application of coconut stage is very helpful. The book itself is a work of art, and having made the trip to the book shop in London when I was there was something I am really thankful I did. It is a gorgeous enormous cookbook containing only baked desserts. 500+ of my fellow daring bakers all did excellent jobs with their cakes - and I salute you! Thank you, fellow daring bakers, for your kind support in helping me stretch my wings and step outside of my comfort zone. And thank you Dorie, for creating such a beautiful book. I add it lovingly to my small collection of English language baking books. This Daring Baker's challenge was hosted by Morven. A truly beautiful cake ! Lucy, your cake looks lovely. I just adore the petits oeufs you sprinkled on its top. Love your cake with the little easter eggs on top! Looks great and I love the easter egg decoration. Great idea! Yes, I had planned to do this cake for Easter too but kept putting it off. Not even a good excuse except laziness. Your cake looks yummy! Did you have any problems not being able to find cake flour? I had a box stashed away. There is a terrific method for making your own cake flour and really gives the results that cake flour cakes give. If you are interested I am happy to tell you how it is done. I bake with a lot of American cake recipes and have done my nut trying to find cake flour to no avail. This method has been a fantastic find to me. That is a beautiful cake, Lucy. If I can give you a piece of advice in spreading the icing, just submerge the knife, or whatever you are using to spread, in water before spreading and the icing will stick to the cake and not the knife. That is something my mom taught me a couple of years ago and it works great. I think you did a great job. I love this cake as you can build it up and adapt it so monay ways. Keep trying with the buttercream spreading. With practice it all comes together the way we want it to. What a pretty cake Lucy...the flavours are so fresh & so Spring. I love the read through too...vacuum cleaner & all. The Easter eggs sprinkled randomly on top give it a magical look...very nice! just lovely! The eggs are so cute and your commentary is great! I had to buy the book too! I think your cake it beautiful!! The last several blogs in my lineup have featured this cake and they all look fabulous! It seems most are experiencing the same difficulties with insufficient rising, but everyone has just rolled with it. I love to see how everyone has frosted and decorated theirs. What a treat. Your cake looks gorgeous!! Wonderful job! Lucy, your cake looks lovely, in spite of the not rising issues. Great job on the challenge! looks so perfect for easter! just gorgeous. The cake is beautiful! Lovely decorated! I love the Easter egg shaped candy on top--very Spring-y! I love the picture with the slices taken out. The easter eggs for decor is simple but so whimsical. Great job! You did a great job, so pretty, and love your cake stand too! what was it with layers anyway? So many people had the problem with the cake not rising. I still can't figure out why mine over rose! Oh well. Your cake looks fabulous! 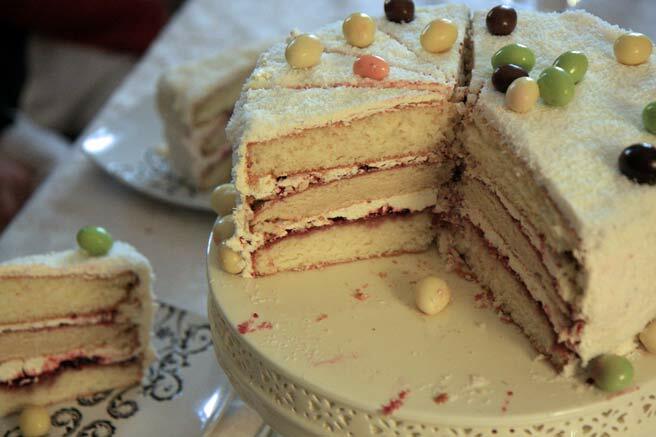 If I make this again I would probably make 3 layers instead of having to split the two tender cakes into halves. Your cake is beautiful! I think it's a work of art, as is your blog! My layers did not rise very much either, which was amazing considering the amount of baking powder in the recipe. I thought they would be really tall!! Nevertheless, it was a really delicious cake! Oh, yes! So glad you liked the cake. I too think it is a lovely balance of flavors. Yes, I really loved my visit to Books for Cooks and it's a lovely book! Great going! I love the vacuum cleaner tip! That is a beautiful cake! The decor makes it so inviting! Lucy, I love your picture and reading your description of your cake! I have to agree with having a vacumm near by, I had toasted almonds all over the place!! What a beautiful cake (and cake stand)! Well done. The coconut is a messy one indeed. The cake is beautiful. I just picked up Dorie's book today and can't wait to dive into it! Love the "fairy bridge of flavour" Lucy- your cake is beautiful! I agree, this cake is lovely in flavors that really compliment each other well. Your's looks wonderful! Nice job! You will love everything in this book, it's really fabulous! ur cake looks awesome!!!! The little eggs are so adorable!!! Your cake came out beautifully! I love the little eggs!! I really love your decoration, a little egg is so lovely. YUMMMMMMMMMY!!! Oh that looks like such a treat, ya know I'm not sure I have ever made a layer cake in my life...how odd now that I think about it. Your pretty cake has me tempted though. I actually bought Dorie's cookbook as a present for a relative at Christmas...it was verrry hard to part with it. haha Perhaps I'll get my own copy. Your cake turned out lovely. You did a great job on your cake! I just love all the Easter decorations on it. Beautiful. Lucy, your cake is gorgeous! The layers didn't rise much at all for anyone, which made them very tricky to slice into layers. I agree that it was a delicate tasting cake. Your cake looks great! I really like the Easter egg decoration! Very well done! oh my oh my..this is one lovely lovely entry for this month's challenge !! !im impressed!!! Love your beautiful tiny eggs.. they look so so adorable! What a great job. Just gorgeous. WOW great job on the cake and I think it looks super yummy! I love the decorations on top! Lucy -- You did a lovely job on your cake. I love the candies on top. They are a very whimsical touch to your beautiful cake. That's a wonderful Easter cake. I wish I'd thought of putting Easter egg candies on the cake. I had them. And my cake was so plain. As usual, I love your photographs. What a beautiful cake! I would have never guessed about the troubles with the cakes rising (I had the same problems). The coconut flakes look so delicate and fine. Just lovely. Your cake looks great! I had trouble getting the cake to rise as well. I think there is a mistake in the directions for this cake. If you beat the egg whites stiff and fold them into the batter, having added the milk to the butter/sugar/flour mixture, the cake should rise beautifully. Beautiful job on the challenge! Your layers are the perfect height! What a pretty cake you made, and a very warm homely picture you took of it too. Lovely cake! I agree, the book is wonderful, so many beautiful recipes. Such a pretty cake, especially with those sweet little pastel eggs on top. The coconut did cover some mistakes with the buttercream...an my dog decided that the flakes that fell to the floor as I did the sides were his treat for the day :)Dorie does it again...and you did a lovely job! Your cake looks so elegant. Truly wonderful job. Your cake looks so tall and lovely! What are you using to decorate the top, btw? Hey! Your blog is great! I really enjoy all of your pictures. I recently started my own blog: http://iheardyoubakecakes.blogspot.com Any advice would be greatly appreciated! Thanks! I love your blog....and your cake looks wonderful as well :). Your cake looks delicious. I like how you decorated it. Looks perfect for Easter. Wow! That totally rocks. I love the topping. Seems like a lot of folks were plagued with the rising issue. Oh well, seems like you totally got past that and worked wonders! It's a thing of beauty! Considering the difficulty so many of us had with it I think we deserve a huge round of applause for turning out such gorgeous cakes. Well done! You may have been out of your comfort zone but it would never be obvious without you saying so.